The Air Jordan V 3Lab5 “Elephant” is one of just a couple of retro Jordans that have been confirmed so far for September, 2013. The sneakers have a premium feel to them between the all-over anmimal print to that unique, molecular box. Even the tissue paper inside is special-featuring embossed logos pulled from the elemental backstory. 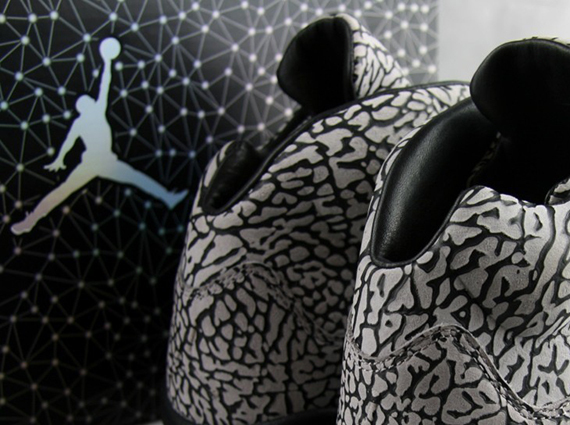 The shoe is the first in what should be a prolonged series of Air Jordan releases that borrow from one another, this pair obviously borrowing the elephant print of the classic Air Jordan III. See the shoes in better detail below and then grab them ahead of schedule from ajaddiction on eBay.